Wolferion EN/US: Why we tend to make the same mistakes in politics? Why we tend to make the same mistakes in politics? Just a thought: Why we tend to make the same mistakes in politics? Hi guys. Sorry for delay, but I am currently preparing myself for exams and writing my bachelor tesis, so I had a little time to write something. Somehow I managed to get some time and finish this topic. I recognized lately, that among the youth, there are created two factions. One Stands for communism, the other one stands for capitalism. So I decided, that I should say something about it. Adam Smith (5 June 1723 OS (16 June 1723 NS) – 17 July 1790) was a Scottish moral philosopher and a pioneer of political economy. 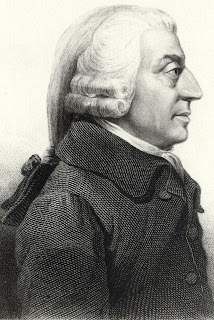 One of the key figures of the Scottish Enlightenment, Adam Smith is best known for two classic works: The Theory of Moral Sentiments (1759), and An Inquiry into the Nature and Causes of the Wealth of Nations (1776). The latter, usually abbreviated as The Wealth of Nations, is considered his magnum opus and the first modern work of economics. Smith is cited as the "father of modern economics" and is still among the most influential thinkers in the field of economics today. Smith studied social philosophy at the University of Glasgow and at Balliol College, Oxford, where he was one of the first students to benefit from scholarships set up by his fellow Glaswegian John Snell. After graduating, he delivered a successful series of public lectures at the University of Edinburgh, leading him to collaborate with David Hume during the Scottish Enlightenment. Smith obtained a professorship at Glasgow teaching moral philosophy, and during this time he wrote and published The Theory of Moral Sentiments. In his later life, he took a tutoring position that allowed him to travel throughout Europe, where he met other intellectual leaders of his day. Smith then returned home and spent the next ten years writing The Wealth of Nations, publishing it in 1776. He died in 1790 at the age of 67. And the most important part, he was the father of capitalism. 1883) was a German philosopher, economist, sociologist, historian, journalist, and revolutionary socialist. Marx's work in economics laid the basis for the current understanding of labour and its relation to capital, and has influenced much of subsequent economic thought. He published numerous books during his lifetime, the most notable being The Communist Manifesto (1848) and Das Kapital (1867–1894). 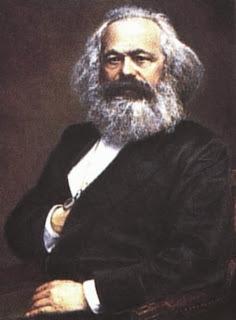 Born into a wealthy middle-class family in Trier in the Prussian Rhineland, Marx studied at the University of Bonn and the University of Berlin, where he became interested in the philosophical ideas of the Young Hegelians. After his studies, he wrote for a radical newspaper in Cologne, and began to work out his theory of dialectical materialism. He moved to Paris in 1843, where he began writing for other radical newspapers and met Fredrick Engels, who would become his lifelong friend and collaborator. In 1849 he was exiled and moved to London together with his wife and children where he continued writing and formulating his theories about social and economic activity. He also campaigned for socialism and became a significant figure in the International Workingmen's Association. Marx's theories about society, economics and politics – collectively known as Marxism – hold that human societies progress through class struggle: a conflict between an ownership class that controls production and a dispossessed labouring class that provides the labour for production. He called capitalism the "dictatorship of the bourgeoisie," believing it to be run by the wealthy classes for their own benefit; and he predicted that, like previous socioeconomic systems, capitalism produced internal tensions which would lead to its self-destruction and replacement by a new system: socialism. He argued that class antagonisms under capitalism between the bourgeoisie and proletariat would eventuate in the working class' conquest of political power in the form of a dictatorship of the proletariat and eventually establish a classless society, socialism or communism, a society governed by a free association of producers. Along with believing in the inevitability of socialism and communism, Marx actively fought for their implementation, arguing that social theorists and underprivileged people alike should carry out organised revolutionary action to topple capitalism and bring about socio-economic change. Marx has been described as one of the most influential figures in human history. Revolutionary socialist governments espousing Marxist concepts took power in a variety of countries in the 20th century, leading to the formation of such socialist states as the Soviet Union in 1922 and the People's Republic of China in 1949. Many labour unions and workers' parties worldwide are influenced by Marxism, while various theoretical variants, such as Leninism, Stalinism, Trotskyism, and Maoism, were developed from them. Marx is typically cited, with Émile Durkheim and Max Weber, as one of the three principal architects of modern social science. The father of communism, ladies and gents. Theory can be nice, but it doesn´t mean anything if the reality is cold-blood different from it. When I see the aftermath of communism, and realize the money behind it, in our everyday reality, it concludes, that communism was just as same as capitalism. I mean that they were parts of something different. I am talking economics here, not conspiracy. You need to look at it as a whole thing, because if we have globalization, let´s use it. I am not saying that Marx was wrong, because at the end, it´s the people who take your words, and do them and understand them as they imagine. Theory cannot be infinite, so it can not count with every possible variable, so this is why theory in reality always works different. Because, if theory reaches the regions in reality that can be a negation to her itself, people change it a bit, to get past through this "negation". An example is everybody that is living currently. You have your opinion which is based on some idols, wich F. Bacon stated, and so others people. Generalizing and defining is the problem because it is limiting, and thus creating a changing course of history, politics, economy etc., if applied. You are stating as if you were inserted in the history of comunism, but if you look on it objectively, and by it I mean world, you wold understand that economics were behind it. I am not promoting capitalism, because it also started as a good idea like comunism, and it turn out like this. The problem itself is in human freedom, because by every new person borned in this world, your posibilities rise, but also your responsibilities, and you are more and more "caged" by the freedom of others as they are by yours. For example if you were at that era of birth of comunism, as one from the hard working labors, you will promote it, but if you were a richman, you even won´t think about it. Communism vs Capitalism in their roots, are making many ethical questions, as they opose each other, as for example, is it ethical to take people´s fortune and divided between the people, that didn´t help him to conjured it? Those types of quesions are, as I say "explosive" because they imply thousand of others questions, like for example, "when can you call someone rich and by which conditions? ", or, "it is good to crush someones ego, for others to benefit, and if yes, it is good if you decide about others lives?" and so on... You see, these kind of questions have many sites, because you can apply view, and also you need to define many abstract words, like the word "good" itself. 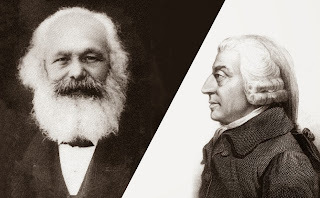 Marxism is the kind of philosophy, that was written for only and only one subject (person), that will change itself by Marxist doctrine because of their own free will. If those persons gather together without the others that were againts it, marxism would work perfectly. And that´s why comunnism was created, an unperfect version of the theory that tried to drill trought reality, as I stated above. Btw, that´s how you avoid many ethical questions and have a good society. Yes, I distinguish those two, because as I said, theory and reality doesn´t mix up well. Capitalism gaved free hand to everybody so you can be truly free, but it was poorly constitued, because those that "were in business" for years prevailed those that freshly started (what happened in Slovakia after fall of the comunnist party in 1968), so it wasn´t a fair trade (as speaking of chaning from comunism to capitalism). At the end, the real question is revolving around ego of every individual, separately, not generalized in some sort of "-ism". As Einstein said "Everything is relative", so for every group in country, can be a different "ideal goverment". As you can see, the problem is with the individual, so that´s even why I don´t agree with Hegel´s "world spirit", because it is too much generalized and mechanical as I say. Causality of actions is more like, in my opinion, as something as an arithmetical mean of "butterflies effect" + time, so relying on history has a 50% argumental strenght (because many people here often say, how great time it was during the communist era), because conditions nowdays are different and even if the problem is the same, the "old bandaid" would not fix the problem, because it will cover up lesser and lesser problems everytime you used it, because oportunities evolve and change. If you apply old things, over and over, the progress would stop, and yes living and goverment develops human nature and affects technology and others thing. If capitalism would fall, which it will someday, it needs to be substituted by something new, so we can grow. Look objectively. So at the end, the capitalism will fall, but it will change into something new and different, not communism, because every theory is aplicable only on a certain time and space. What do you think? If you want to be updated on the upcoming topics, follow me on Twitter. See ya next time ;).